The AI and ML Awakening is Here...But Do We Care? Anyone watching the tech world can’t miss its ever-increasing focus on AI (artificial intelligence) and ML (machine learning). From well-known examples like Google’s self driving cars or Amazon Alexa’s voice recognition, to lesser known applications like the Nature Conservancy’s efforts to count fish, machine learning seems to be everywhere. The reasons are clear - AI and ML are seeing staggering improvements in results due to a variety of factors, most importantly the (re)emergence of deep neural network (DNN) based approaches as profiled in this excellent recent article in the New York Times magazine, “the Great AI Awakening”. 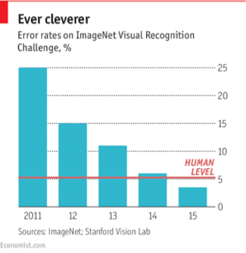 One key example of the improvement in results was in the popular ImageNet photo recognition challenge, where computer AI algorithms compete to analyze and identify the contents of thousands of images. There the introduction of DNN approaches in 2012 caused significant improvements in the results to the point that the computers can now “see” and categorize ImageNet images even better than humans (chart below). Companies like Microsoft, Apple, Facebook, Salesforce and Alphabet (Google) all have major machine learning initiatives. And just this month, news broke that MIT researchers (full disclosure: one of whom also works with us) are using deep learning to begin training systems that can predict the future by observing the past. This gap points to why relevant and tangible examples are critical. Just because a car can detect the difference between different kinds of signs, what can this mean for the management of photo and video content in construction and capital projects? Why do we care? That’s our obsession at Smartvid.io. We’re making strides every day; most recently, we’ve added automatic detection of cracks or safety issues in your photo and video content (more on this soon). We’re driven by our peers’ progress, our imagination, and the questions of possibility. What could you do if you had a set of autonomous eyes watching your photos and videos at all times? What would you want to find if you could analyze your photo and video content by anything that is seen or heard in it? The CEO of Alphabet (Google) has gone so far as to say that “Machine learning is a core, transformative way by which we’re rethinking everything we’re doing…”. As professionals in the engineering, construction, capital projects world, are we thinking that way? We are. And soon, in partnership with ENR (Engineering News Record) and some of our customers, we’ll have some very interesting results to share. If you are interested in joining us in the journey to bring this AI and ML revolution to industry you can start here: check out our demo video or shoot us a note to get started!